How France fell out of love with Minitel. The Minitel - a rather sinister, computer-like terminal attached to classic telephone landlines - was installed in one million French homes by 1985. 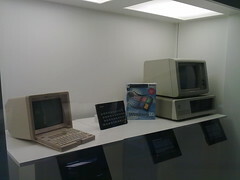 At the end of the 1990s, nine million terminals were linked to some 25,000 Minitel services. So the French invented the internet? No, not exactly. En España estos dispositivos fueron conocidos, sobre todo en algunas empresas grandes y administraciones como sistemas de comunicación interna y también para tener acceso a algunos proveedores de información (ver Videotex.